Improving the delivery of immunotherapeutics or immunomodulatory molecules is key to improving cancer vaccines. Nanoparticles (NPs) represent an ideal vehicle for in vivo delivery of cancer immunotherapy or cancer vaccines. We pioneered a nanoparticle molding technology, PRINT® (Particle Replication in Non-wetting Templates), that allows unprecedented control and specification of the physical/chemical properties of NPs. PRINT can produce particles with varied parameters such as shape, size, porosity, and chemical composition and therefore represents an ideal platform to test such parameters to achieve optimized anti-tumor vaccination and immunity. Additionally, we and others have shown the potency of small molecules comprised of PAMPs (Pathogen-associated Molecular Patterns) which engage the pathogen-recognition receptors (PRRs), elicit adjuvant activity, and activate desirable anti-cancer immunity. The use of PRINT to deliver these adjuvants is ideal in that PRINT nanoparticles are taken up by antigen presenting cells, which when activated can elicit strong specific T cell response. 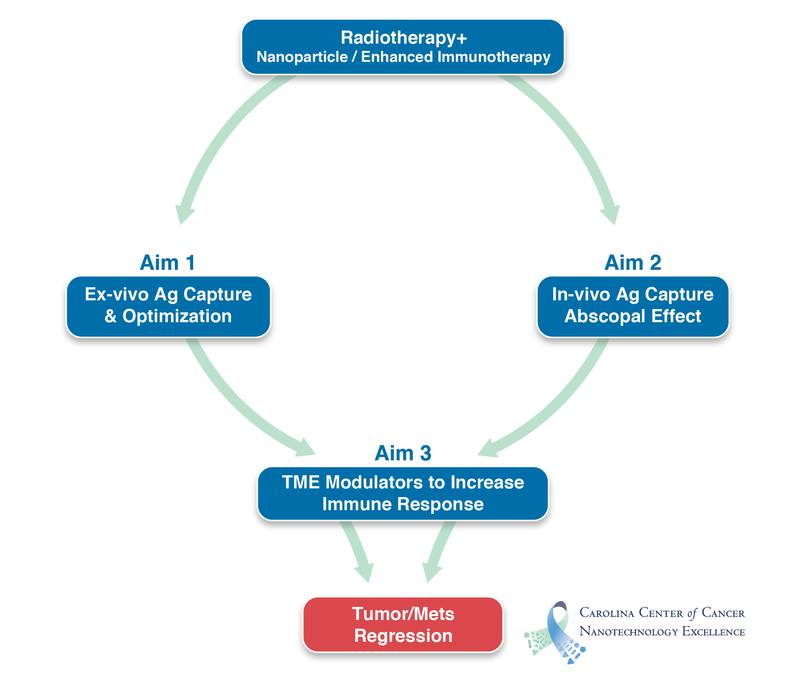 Another key finding is that successful therapeutic cancer vaccines must be able to induce a robust response to circumvent the highly immunosuppressive nature of the tumor microenvironment. The most promising results have been obtained by combining potent cancer vaccines that elicit strong anti-tumor immunity with immune modulating agents that help to break immunological tolerance. Nanotechnology represents a promising system to deliver small molecules to the tumor site to more efficiently inhibit immune-tolerance inducing pathways. The goal of this proposal is to address these three key issues.